When God says, “Shut up so I can talk”: 20 years of Prayer in 2200 words. Recently, I’ve experienced the second great sea change in my prayer life. Now, I’ve had a number of conversion experiences, major theological realizations, etc., over the years, as well as periods where I’ve been better about praying than others. But, in essence, my prayer life has remained the same since I was a teenager. I’ve always figured this meant I was either quite advanced or else hopelessly lost. Every time I’ve read the Interior Castle, I’ve figured I’m stuck in Room 1. At the same time, I have my bad habits and sinful tendencies that I’ve likewise figured were either hindering my prayer life or else were the proverbial “thorn in the side” God was using to keep me humble (fat lot of good that did). So, I trudged along, just waiting for God to do what He needed to do. In fact, I didn’t think there was anything “wrong” with my prayer life, because in my study of the writings of the Saints, it seemed like I was doing OK. I recognized the experiences they described, to tell me I was doing things “right,” and I just figured it was a matter of time before I’d reach contemplation, or else I was already there and didn’t know it. Christmas 1996, after my aortic root replacement, was our first Christmas with the Internet and Amazon.com. I had made my mom a list of books I wanted, and categorized them into novels, philosophy, spirituality, etc., so she could pick a book or two out of each category. Instead, she gave me the *whole* list. Among these were many Saints whose writings I always wanted to read. After my formal studies began as a Carmelite, I picked up several Carmelites I hadn’t read yet. Prior to that, I’d read a lot *about* saints, but not a lot *by* saints. I do remember reading the Life of HM Teresa of Avila when I was in high school, from the Catholic high school library, but I don’t remember when, exactly, or if I read any of her other books. I just remember that that, like my various attempts to read her works over the years prior to 2008, left me feeling like I hadn’t gotten anything out of her. She kind of tends to dance around things, and it wasn’t until I’d studied a other things, particularly Ignatian spirituality. One of HM Teresa’s great mentors was St. Francis Borgia, the great Jesuit (yes, those Borgias–the infamous Pope Alexander VI was his great-grandfather; Francis was a wealthy Spanish prince who married and had children, then had a conversion experience after his wife’s death, signed over his title and fortune to his eldest son and became what we now call a second career vocation) . Another great mentor in her life was St. Peter of Alacantara, the Franciscan. So I had to get a deeper understanding of Jesuit and Franciscan spirituality in order to get a better foundation for reading Teresa. Anyway, I know I read her in high school, and I know that, relatively early in life, I developed an understanding of the female mystics. But God let me understand what He needed me to understand to steer me to the right vocation, and somehow my understanding of the female mystics led me to intuit the Theology of the Body and realize God was calling me to marriage, and, as Chesterton describes, when I began reading the “hard stuff” after that Christmas in 1996, I felt like I was reading stuff I already understood. Now, maybe that high school reading of St. Teresa of Avila was right after I started high school–that much I don’t recall, Senator–but by Christmas 1990 I had developed an understanding of the importance of tears. Teresa of Avila says that, out of all “consolations” one might receive in prayer, holy tears are the most important. Other consolations are like God patting you on the back and saying “Good job.” Tears–which most people don’t even think of as a spiritual experience–tell us we’re really appreciating what Jesus did for us, and short of spiritual or physical stigmata, are a sign that we’re fully understanding the Passion. So the first of the two major “breakthroughs” was the first time I experienced Tears. I’m pretty sure it was during my annual Infant of Prague novena in 1990. 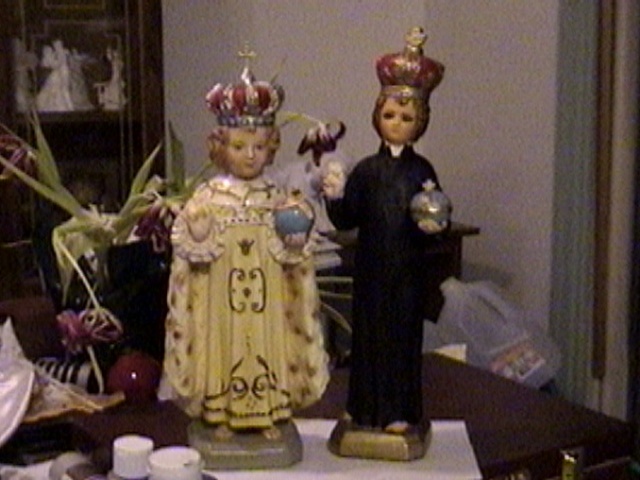 My grandma sent me an Infant Jesus of Prague book in 1989, and I began making a Novena every year from the 16th to 25th of December (technically, two overlapping Novenas). During those years, I’d dedicate an hour or more to prayer, saying not only all the prayers in the Infant of Prague book, but also the Rosary and other prayers. I remember the experience, but I don’t remember whether I was praying the Sorrowful Mysteries or the Stations, but one day in prayer–again, I’m pretty sure it was during my pre-Christmas Novena–I was hit by the realization of the Passion, and I began crying. I knew this was an important spiritual gift, and I got very excited, and told my brother, who thought I was weird. And I know it was no later than 1991 because my brother was living at home at the time. So, for 20 years (WOW), I’ve basically stayed at the same level in my prayer life, which I knew to be a fairly “advanced” level but wasn’t sure why I’ve stagnated. On the one hand, gauged against the “average person,” there’s always a tendency to be like the Pharisee and the Tax Collector and say, “Well, I’m much more advanced than they are.’ However, gauged against the Saints, I knew I was on the right track but missing something, and thought it was just a matter of time. Meanwhile, in my formal studies as a Carmelite, I’ve struggled with understanding certain aspects of Carmelite prayer. Again, I thought I was “doing it right” by my reading of the Saints, but I have heard many different things from living people about it, and it’s really been a puzzle to me. So my question started as a legalistic one: I always figured that as long as I was practicing “mental prayer,” which I was, I was on the right track and just had to wait for God. Yet most Carmelites insist that the requirement in the Constitutions is for “mental prayer,” not “prayer of quiet,” that even though they’re separate terms, in Carmelite spirituality they’re basically the same thing. So I had to hammer out some conversations with some of my most knowledgeable Carmelite friends, in person and online, and I kind of figured it out. I was praying as slowly as I could. It took me about an hour and a half to say 5 decades. Plus, I was holding in my hands a rosary as well as a big crucifix I sometimes carry with me in the aforementioned method of prayer. So, this time, I just shut up and let it happen, and I experienced Contemplation. Now, this answered a major question about my prayer life I’ve posed from time to time but generally took for granted. I’ve always found that, when I pray a certain amount, I hit what I call a “wall,” where my brain can’t think of the words any more. I start to get a headache if I “try” to pray. I always thought that experience was the Devil trying to stop me from praying, or else it was physical fatigue, so I’d either try all the harder with “vocal prayers” because I was trying to fight the Devil or fight the Fatigue. So, tonight, Mary and I went to a Penance Service. We got there after the “service” part and stood in line for 45 minutes. We got in what appeared to be the shortest line but actually took the longest. We weren’t sure if it was short because the priest was “fast” or because people were avoiding the priest. Apparently, people were avoiding the priest, but depriving themselves of a great gift. We both said it was the best Confession we’d had in years, and we experienced what Confession should be, Christ speaking to us through the priest. Mary’s even pretty sure he addressed her by name even though she didn’t tell him her name. In line for Confession, I prayed Vespers according to the Roman Rite, the Byzantine Rite and the Coptic Rite on my phone, plus the Confiteor in Latin, the Seven Pentitential Psalms, and just whatever daily prayers I could think of. I planned to say a Divine Mercy Chaplet after I got out of Confession. I could feel the “prayer of quiet” coming on even before I went into the Confessional and “shut up” in my prayers when that happened. Then I had this profound Confession experience. I began saying the Divine Mercy Chaplet. I said the Our Father and Hail Mary that were my penance, anyway, and then I started the Creed, but tried to be slow and deliberate about. Then I found that “block” happening in my head. I couldn’t remember the words of the Divine Mercy Chaplet. So I’d just stop. I’d feel the prayer of quiet for a few minutes. Then I’d pray another decade of the chaplet, feel God’s metaphorical hand go up, and stop and go quiet for another several minutes. Invincible Ignorance or Lack of Faith? I’ve been thinking lately about how much contemporary theology is prone to excuse sheer lack of faith. For any given doctrine, including the very divinity of Christ, you’ll hear someone say, “I just don’t believe it.” The Bible is very clear about the importance of taking God at His word. For example, a video has been circulating Facebook of a Muslim imam saying that it’s a sin for a Muslim to say “Merry Christmas.” Of course, technically, from the perspective of Islam, he’s absolutely right. What strikes me most about this video, though, is that the imam insists that it’s not only heresy (from a Muslim perspective) but outright stupid to suggest that God would become Man. He clearly *understands* what the Catholic Church teaches; he just don’t think it’s true because he refuses to believe it. A similar discussion has gone on recently regarding an Irish bishop who told Catholics who are just filling up pews because they see the Catholic Church as a cultural tradition but they have no real commitment to their faith to be honest and leave (kind of like the words of Jesus in Revelation about “be hot or be cold, but if you’re lukewarm, I’ll spew you out”). The concept of “Anonymous Christian” or “Baptism by Desire” suggests that a person who truly doesn’t *know* the Christian faith and has no opportunity to know the faith but would be open to it if he or she were taught it *might* possibly be saved through an extraordinary act of God’s grace. The Feeneyites argue that such a person wouldn’t *need* an extraordinary act because God’s providence would provide such a person with a Christian missionary at the right time. The next stage after that is someone who has “invincible ignorance,” a term which in most formal theology applies to those who are mentally or intellectually handicapped in a manner that impedes their right judgement. Such a person may be told, “Jesus is the Son of God,” but not be capable of comprehending what that means. OK, fair enough. It is always important to remember, when dealing with these questions, that we’re talking about speculation regarding what *may* happen in extremely rare circumstances, to other people. For the most part, the whole point of these hypothesized “extra-ordinary” means of salvation for those outside the Church is that the person in question has never met a Christian. Many contemporary theologians speak of Rahner’s idea of the “invisible Christian,” or of “invincible ignorance” or of baptism by desire, and they apply it to people they know. I’ve argued with some neoconservative Catholics who have a very interesting view of Islam. On the one hand, they claim that Islam is an evil religion (as a religion, it is, but that doesn’t mean all its adherents are evil people), and they claim that all Muslims want to kill everyone else. So they argue that Muslims should be killed. *Then* they say, when confronted with the fact that they would be sending these Muslims to Hell, that, “Well, Muslims are invincibly ignorant, so they can still go to Heaven.” So they’re Evil, and they deserve to be nuked because they’re so Evil, and they’re going straight to Heaven?? Some people seem to use “invincible ignorance” as a catch-all for *any* ignorance or any denial of God’s truth, and then basically use it as a catch all to say that just about everyone who isn’t Christian is going to be saved anyway. This is exactly the mentality that RadTrads object to in post-Vatican II thinking. It doesn’t really matter if someone is Catholic, except that it’s an easier way for that person to get to Heaven–supposedly. A similar claim is that Protestants are Christians just as much as we are, and they have valid Baptism (which the do), so they’re OK without the Eucharist or Reconciliation. Yet Catholic dogma clearly states that a person, once baptized, who commits mortal sin cannot be forgiven of that mortal sin without Reconciliation or at least the intention to receive the Sacrament. Again, some Protestants may be forgiven for their ignorance, but all of them? Doesn’t the validity of their Baptism put them in a precarious spot, especially versus the so-called “anonymous Christians” who don’t get sacramentally baptized at all? Now, I’m willing to grant quite a lot in these regards. For example, a Protestant who has grown up with a lot of biases against the Catholic Church and a lot of misinformation may be totally sincere in rejecting some aspects of Catholic dogma. But it just seems to me to be taken way too far. Certainly, again, the very valid complain of many RadTrads is that the generous teachings of Vatican II are used as an excuse by most Catholics–certainly laity but including priests and bishops–to *NOT* engage in their duty to evangelize and their duty to admonish sinners. They’ll even argue that by not evangelizing, they’re helping to save souls by giving them the excuse of ignorance! And what always strikes me when these topics come up is the importance of Faith in the Bible. “Nothing is impossible with God,” we are reminded several times in the Bible. The Bible treats it as a pretty serious crime when God promises or works a miracle and a person refuses to believe. Indeed, it is precisely in this context that Jesus refers to the “sin of the Holy Spirit.” The different places where Jesus says that the “sin against the Holy Spirit” cannot be forgiven in this life or the next are when He’s talking about the Pharisees rejecting His miracles or His ability to forgive sins. Another thought that brought this to mind was a discussion at my Carmelite meeting about St. Paul. I pointed out that St. Paul, when he was persecuting the Christians, was being “righteous.” He was not killing Christians sadistically; he was doing it because he thought it was what God wanted. Out of all the Pharisees who were going around persecuting Christians at that point, Jesus reached out the Paul because Paul was sincere. Paul was ignorant (not invincibly ignorant, just ignorant) of the truth of Jesus Christ. Compare him to the Pharisees who actually witnessed Jesus’ miracles firsthand yet rejected Him. They were *choosing* to reject what they saw before their own eyes. Many of the Pharisees had enough knowledge of Christianity to at least make an informed choice, and perhaps knew full well it was true, but they simply refused to accept what they knew, and they reacted against it in anger. Now, when it comes to what actually happens at personal judgement, I prefer to keep in mind that Our Lord is a Divine Person, and from His perspective, it is all about relationship and about love. I think Judgement is more like C. S. Lewis’s idea of “God in the Dock,” that when each person dies, Jesus appears, and the person either greets Jesus with love or fear, and that’s it–St. Teresa of Avila says something similar. The Sacraments dispose us to be more ready to receive Christ, but that doesn’t preclude some “anonymous Christian” from dying and seeing Jesus and saying, “Hey! You’re the One I’ve hoped for my whole life but never knew about.” But most people outside the sacraments are going to be bound by some kind of sin, and/or they’re going to be bound by some kind of insistence of the absurdity of the Truth. I think of the amazing passage in Les Miserables when Javert commits suicide because he spent his life, he thought, serving God and found out that what he *thought* God wanted was wrong and that God actually wanted mercy. Confronted with his “Road to Damascus” moment, Javert doesn’t change his ways like Saul/Paul did; he turns in his resignation to God and commits suicide. It’s easy to say that maybe the YouTube Imam is missing something. Maybe he is invincibly ignorant in the true sense of the word, incapacitated by mental handicap of some sort (in which it would be the duty of a Christian to pray over him to be healed). But the plain fact of his video is that he is sitting there, claiming to be a Muslim theologian, insisting that he is *not* invincibly ignorant, saying that Christian teaching is that God became Man, which is true, and saying that he refuses to accept that God became Man. Do you *really* think that such a person, so opposed to the notion of Jesus, when he dies and confronts Jesus in Person, will react the way Paul did? And if he *would* react the way Paul did, then why doesn’t God reach out to him now and convert him to Christianity so he can be a missionary? Or rather, when he dies, will he see Jesus and react in outrage that God would so condescend to become Man? Would he say, “I want no part of such a God!” After all, that’s what Satan said. One of the points I usually make about the “Holiday Season” is that, for Catholics, it really is. Not only do we have Christmas, Thanksgiving and New Year’s, but we have Christmas for 12 days, Epiphany, St. Nicholas Day, Immaculate Conception, Guadalupe, etc. So, Happy Holy Days to you, stupid secularists!